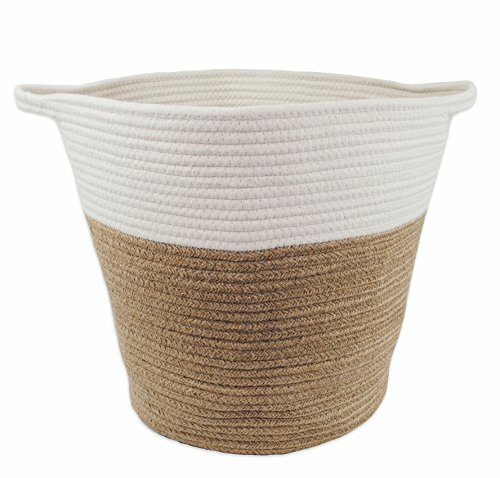 Large Toys Storage Basket for Nursery Or Living Room 16" x 15", Jute and Cotton Rope by Monarch Co. This basket is the perfect marriage of organization and beauty! It's so versatile that it can be used to transform any space. This basket is PERFECT for laundry, kids' toys, blankets, indoor trees/plants, or anything else you need organized. The unique TAPERED DESIGN allows the basket to be filled with as much or as little as you need while still maintaining its shape. Neutral colors woven with 100% natural COTTON rope and 100% HEMP rope. We designed this basket to work in any home, nursery or office décor theme. Since it is 100% CHEMICAL-FREE, it is non-toxic, and the best choice for use in your home or office. At Monarch Co. we marry organization with on-trend designs in order to create transforming solutions for your home and lifestyle. ✔️ Add STYLE & FUNCTIONALITY to your home! This basket is PERFECT for laundry, kids' toys, blankets, indoor trees/plants, or anything else you need organized. ✔️ Dimensions: 16" top diameter, 12.5" bottom diameter, 15" height. The unique TAPERED DESIGN allows the basket to be filled with as much or as little as you need while still maintaining its shape. ✔️ Neutral colors woven with 100% natural COTTON rope and 100% HEMP rope. Designed to work with any home, nursery or office décor theme. ✔️ CHEMICAL-FREE, and safe for use in your child's nursery, playroom or common area. ✔️ At Monarch Co. we marry organization with on-trend designs in order to create transforming solutions for your home and lifestyle. If you have any questions about this product by Monarch Co., contact us by completing and submitting the form below. If you are looking for a specif part number, please include it with your message.